It’s award season, not only for books, but also music, movies, and plays. A lot of the time, I’ve never heard the names of people nominated, although that shouldn’t diminish the recognition that they deserve. But I’ve been thinking, well, maybe I ought to give out a few awards of my own. (DISCLAIMER: The awards made in this blog entry are solely attributable to the blog post writer, me, C. Michele Dorsey. No blame should be placed on the shoulders of my fabulous blog mates, the Miss Demeanors. ) Now that we have that out of the way, I am announcing the SASSIES, Still Awesome Sustainable Series I Enjoy Savoring. I read a ton of books, lots of them are marvelous, but the SASSIES are about books I wait for, as in I usually know the pub date and anticipate it eagerly. The SASSIES have characters I consider longtime companions if not friends. Their authors are writers whom I admire and frankly have a literary crush on. I write sentences from their books in a notebook reserved for “Sentences I Wish I Had Written.” Some of these writers have been writing the same series since the 1980’s. While I confess I may find an occasional entry in the series a little less perfect than the others, the character evolution and plot development always are at a level I seek to emulate. The writing never fails. Never. And so please roll out the red carpet for Dorsey’s SASSIES: 1. Elizabeth George for her Inspector Lynley series. 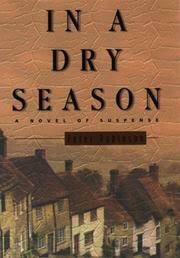 George combines intricacy of plot, fallible characters, and bucolic settings in England to deliver time after time. Her vocabulary has challenged me more than once in each book to head for the dictionary, a trip I thoroughly enjoy. The books can be a tad long, but when they are this good, who cares? The best in the series was“Playing for the Ashes.” 2. Peter Robinson for his Inspector Banks series. Alan Banks and I are growing old together, but I haven’t minded because Robinson is able to humanize his police procedurals, also set in England. Like in George’s series, the reoccurring cast of characters live lives almost as messy as those of the criminals they pursue, but Robinson never lets that get in the way of the story. My favorite in the series was “In A Dry Season.’ I do wish Inspector Banks hadn’t changed his taste from opera and classical music to rock. 3. Tana French for the Dublin Murder Squad series. Stunning writing, brutal storytelling, and characters that stay with you make this newer series one of my favorites. 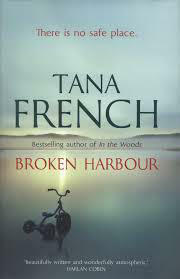 I’m hard pressed to pick a favorite, but I can tell you “Broken Harbor” was spellbinding and haunts me to this day. French’s books keep me up at night and often have me switching from audio to print versions so I don’t have to put them down. 4 Louise Penny for the Inspector Gamache series. I came late to this party, reading the tenth book, “The Long Way Home” first. By the third chapter, I wanted to move to Three Pines where Penny has created a village of imperfect characters who all care about each other even as bodies fall around them. I was so taken with Penny’s writing and ability to create characters you truly feel you know, that I vowed to read the all in order. A year ago I ventured back to Three Pines and read each book in the series in succession. When I was done, I felt a void. 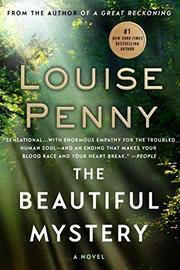 I tried the if-you-like-Louise-Penny-try this author without success, which is a true tribute to the cast of characters she has brought alive for readers. My favorite is “The Beautiful Mystery” set in a cloister of monks in the wilderness of Quebec, a brave endeavor skillfully executed. 5. 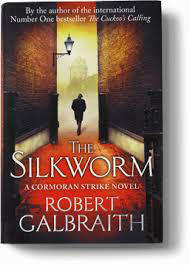 Robert Galbraith (J.K.Rowling’s pseudonym) for the Cormoran Srike series. I hadn’t followed the Harry Potter series closely, so was surprised at how well the characters captured me and had me waiting for the next in the series. Strike is former military police and an amputee who has begun his own private investigation business. The tension between Strike and his assistant, Robin, rivals Bruce Willis and Cybill Shepherd in Moonlighting. 6. Sue Grafton for her Kinsey Milhone series. 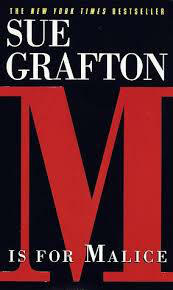 I went through the alphabet with this series, never imagining it would be cut short at “Y” by Grafton’s recent death. Kinsey’s quirkiness coupled with a truly sad childhood not born of cliché made me bond with her early. Grafton’s ability to use small details to flesh out her characters inspired me to write. My favorite was “M is for Malice,” in which she portrayed the murder victim with such melancholy, I felt the need to mourn him, much as I do now this gifted author. I will miss Kinsey Milhone. 7 William Tapply for his Brady Coyne series. Tapply died nine years ago, but I gave him a SASSIES award because every year, I miss having a new Brady Coyne mystery to ready. A wonderful writer, Tapply created an irreverent lawyer who preferred to be fishing on a river than in a courtroom. All of his books are good, so if you’re looking for a series to devour, consider this one.So there you have it. The 2018 SASSIES are now history. I am grateful to each of these authors for consistently giving me something to look forward to each year. Keep on writing!Who would you give a SASSIES award to?